IMAGE | Jordan Mitchell-Fletcher, Made Unmade, 2015, installation detail | Image courtesy of the artist. Twice, I have walked into Jordan’s studio when she wasn’t expecting me. The first time, last year, she was sitting on the curved concrete cast that had been housed in her studio all year, despite being almost always covered up. She was rolling a plasticine coil for a small pot she was making. She told me that this was what she did when she didn’t know what to do, or she wanted to think. Later, this coil pot was used when she installed her work in the project space, to prop up one corner of the base of the large plaster cast of a corner of her studio. It was squashed almost beyond recognition between the weight of the cast, and the pressure of the floor. I remember wanting that pot, and although I couldn’t have said why, I sensed it might help me to think also. 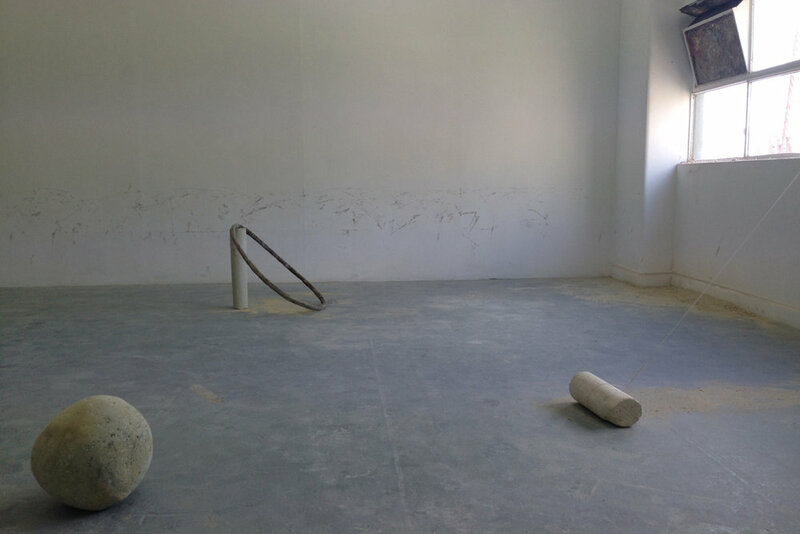 The second time was during her residency, here at Blindside, when I came across her sweeping the floor with a large broom, weaving around the objects in the room in one long movement across the space of the gallery. She explained that she was just cleaning up. 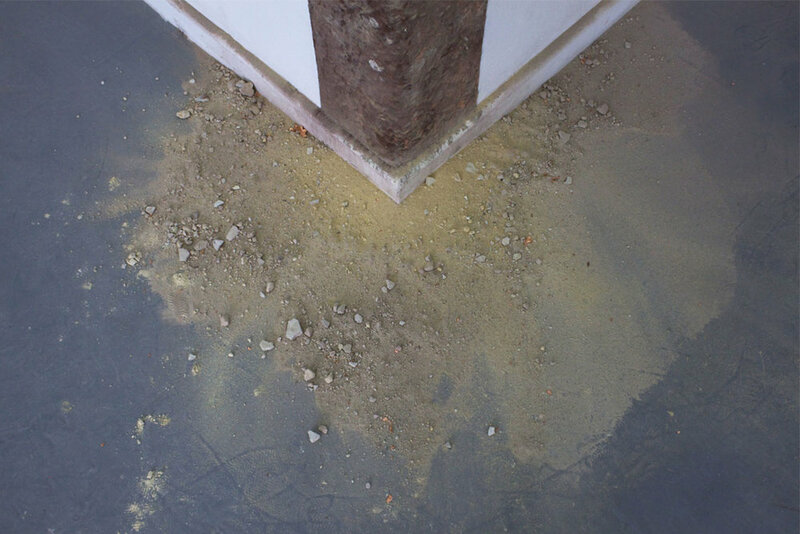 We stood in the space, looking around at the work she had been making, eddies of sand and clay dust marking out the forming and dispersion of the objects that were placed, dumped and crumbled on the floor. It wasn’t until I was walking home that I realised how this sweeping was a part of the work in the same way as the coil pot had been – as a (seemingly insignificant) measure of energy. Ball, block, corner, hoop, post, pillar, window, window weight, midpoint. These objects, or bodies, are held together by the pressure of other bodies, or objects (material, physical, realities), subjects of dissociation and/or affinity, chemical change and/or equilibrium, The actions impressed in the forming of the objects are also dispersed through the relations produced between these same actions as chemical and physical reactions and the distribution of the energy of the changing system (the forces of each others’ energies, circulations, conductivities and flows). These relations are traced in the space as it in turn exerts energy on the objects. This energy is also transmitted through the haptic action of our viewing, our movement, our standing, the force of our attention, as these too form and deform the work. What begins? the long action of forming the sand ball, its rolling, its adherence to itself, its slow growth and its friction on the floor; or its placement on the floor, the accumulation of pressure through time spent in one spot, and the slow resistance of floor to ball that actions its disintegration and return to the floor as sand. A clay mould pressed into a vertical corner of the room requires three props to corral it into place notwithstanding its inevitable collapse. Yet this clay has also adhered to the wall surface, sucking it outwards in a symbiotic grip as it slowly crumbles and falls back into the current of the room. The joy of this work is in the way it defeats formalisation – material or semantic. But this is not to say it is mute – rather it is we who are struck dumb within it. Action dissipates/structure decays. The experience of this work and its differential forces is not of something that appears as stable matters or as organizing forms, but rather of something that is in close contact with itself. Jordan Mitchell-Fletcher’s work is engaged with the idea of materiality as encompassing a conglomerate of relations in which matter is modified by time, change and process, rather than being something inert. Working with responsive, generative and durational materials, the intention is to construct a temporal arc, an open-ended situation in which the presentation is just a moment in the timeline of the work. The practice exemplifies the processual life of the artwork in order to open up possibilities for how the work is engaged and encountered in a given space. Enacted over time, these gestures are assembled into the installation as residues that emerge from the work’s array of processes.